Nasal congestion in simple terms is known as a ‘blocked nose’ or ‘stuffy nose’. This happens when there is swelling in the nasal cavity, leading to a buildup of mucus. As a result, it becomes difficult to breathe normally. This problem is often associated with colds, flu and allergic reactions. When nasal congestion lasts longer than one week, it may be due to acute sinusitis, dry air, hormonal changes in the body, hay fever, occupational asthma, pregnancy, stress, thyroid disorders and excessive tobacco smoke, to name a few. Although less common, nasal congestion can also be caused by polyps or a tumor. A blocked nose can be more than merely annoying. It is a matter of concern for children whose sleep is disturbed. It is important to treat it immediately or it can cause other problems, such as ear infections, restless sleep and so on. There are many ways to clear congestion. This very common problem can be easily treated by using ingredients already in your kitchen. Use any of these remedies as needed to relieve discomfort until you are well again. Here are the top 10 home remedies for nasal congestion. Apple cider vinegar is one of the best remedies to clear a stuffy nose quickly. It works as a natural decongestant that helps break up congested mucous and provide excellent relief from a blocked, stuffy nose. Also, the potassium in it helps dry up a runny nose. Plus, being rich in several nutrients, it is good for your overall health and immunity. 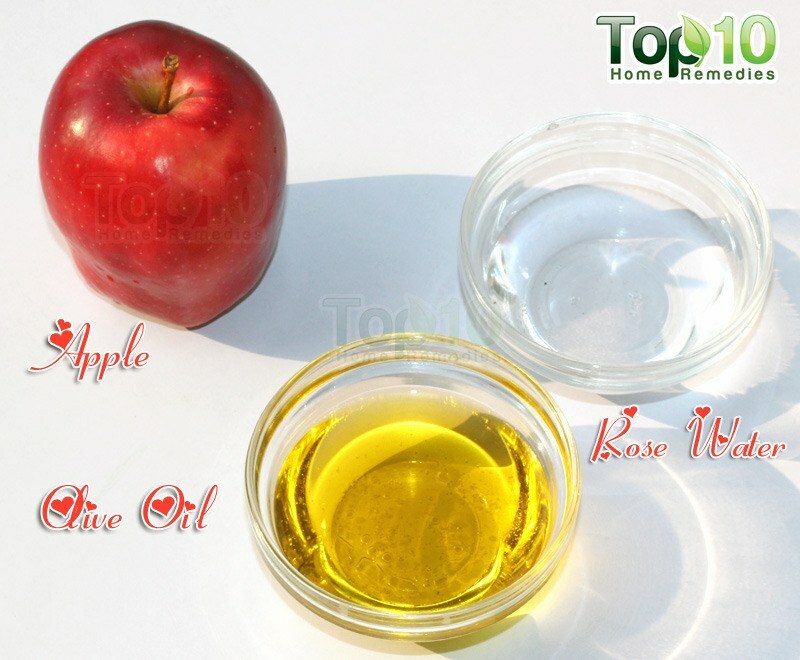 Mix 2 tablespoons of raw, unfiltered apple cider vinegar and 1 tablespoon of raw honey in a cup of warm water. Drink this 2 or 3 times a day for a few days. Also, pour equal amounts of water and raw, unfiltered apple cider vinegar in a pan. Bring this mixture to a boil, then inhale the steam. Make sure to close your eyes or it will sting the eyes. Do this 2 or 3 times a day or as needed. 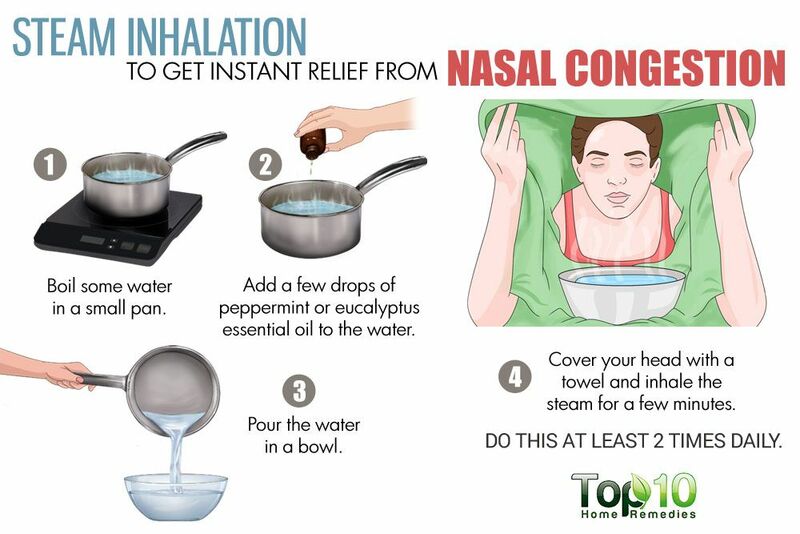 Steam inhalation is another popular home remedy for instant relief from nasal congestion. 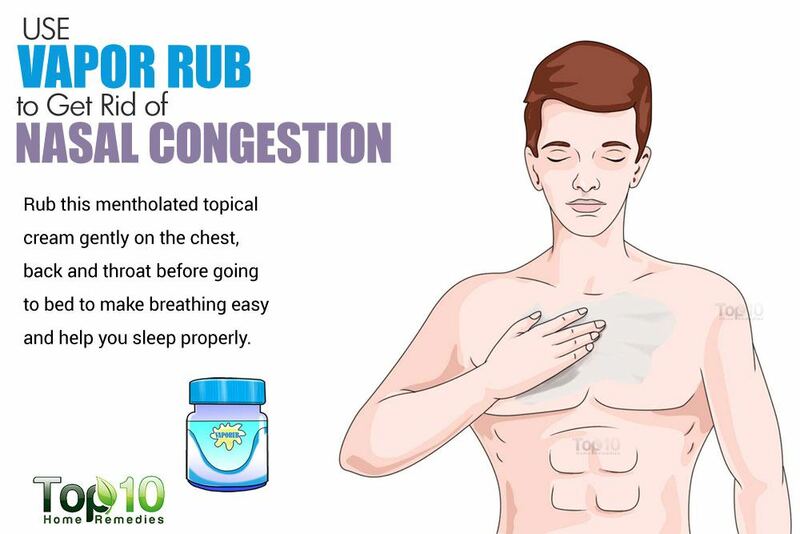 It works as a natural expectorant to clear the congestion and also lubricates the irritated respiratory tract. You can use any of these remedies 2 to 4 times a day. Keep your head about an arm’s length away from the water and a towel over your head to trap the steam. Add a few drops of peppermint or eucalyptus essential oil to boiling water and inhale the steam for about 10 minutes. Add 1 tablespoon of crushed carom seeds to boiling water. Inhale the steam for about 10 minutes. Inhaling steam from a humidifier or hot bath can also help decrease congestion. Note: Steam inhalation is generally not recommended for younger children (below 12 years of age) because of the risk of scalding. Also, it may not be suitable for pregnant women, and those suffering from high blood pressure, heart condition or central nervous system disorders. Nasal irrigation with a saline solution can also be used to treat nasal congestion. 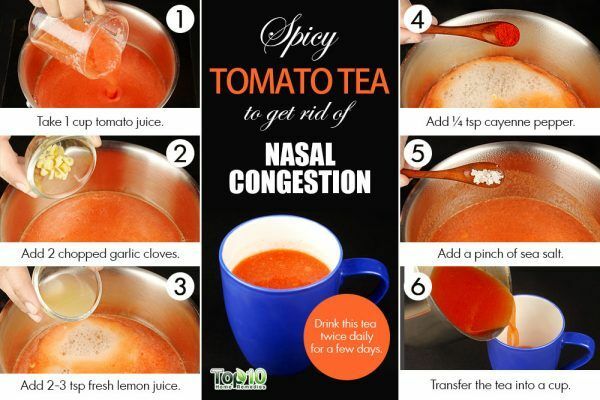 It helps wash away the mucus and irritants from the nasal passages and give you excellent relief. To prepare the saline solution, mix 1 teaspoon of non iodized salt (iodized salt can cause irritation in the nasal passages) in 2 cups of warm distilled water. 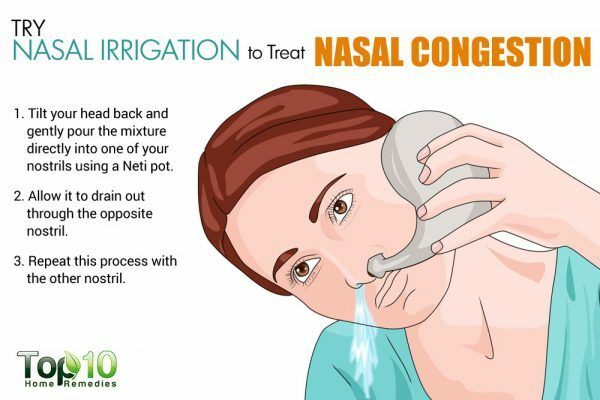 Here are two popular methods of nasal irrigation. A Neti pot, a container designed to flush mucus and fluids out of your nasal passages, is a popular device for doing nasal irrigation. To rinse the sinuses using a Neti pot, tilt your head back and gently pour the mixture directly into one of your nostrils. Allow it to drain out through the opposite nostril. Repeat this process with the other nostril. Another option is to pour the salt solution into the palm of your thoroughly washed hands and inhale it through one nostril at a time. Use either of these methods once or twice daily for a few days. Note: Make sure to use distilled or previously boiled water for nasal irrigation and wash the irrigation device after each use. 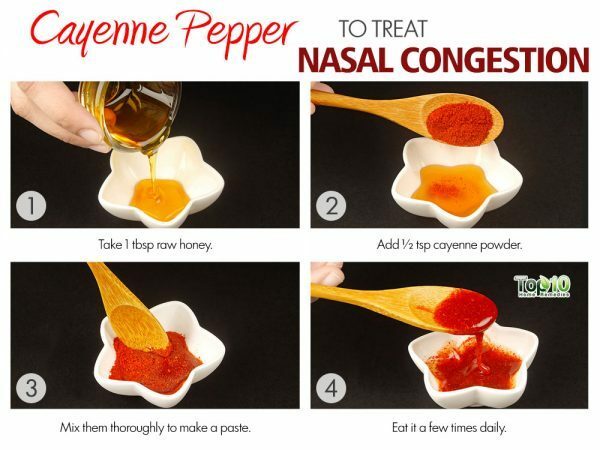 Cayenne pepper is highly effective at relieving nasal congestion and blocked sinuses. The capsaicin in it works as a natural decongestant to provide relieve from inflammation in the nasal passages. Plus, the fiery effect of cayenne induces a runny nose to get rid of the mucus and allergens in your sinuses. This in turn relieves a blocked nose. Add ½ teaspoon of cayenne powder to 1 tablespoon of raw honey and eat it a few times daily. Another option is to dip the tip of a cotton swab into cayenne pepper. Carefully insert the cotton swab into the nose to induce sneezing and clear the sinuses. There will be a burning sensation initially, but it passes quickly and eventually help relieve sinus pressure and pain. Do it 2 or 3 times a day. Vicks VapoRub, a popular over-the-counter decongestant, can provide quick relief from a blocked nose. The active ingredients, such as camphor, eucalyptus oil and menthol, help clear the congestion and make breathing easy and comfortable. Rub this mentholated topical cream gently on the chest, back and throat before going to bed to make breathing easy and help you sleep properly. Also, boil some water in a pot. Turn off the heat and put a small amount of Vicks VapoRub in it. Stand over the pot with a towel over your head, keep your eyes closed and inhale the steam for just a couple of minutes. Repeat as needed. Note: Do not use Vick VapoRub on children below 2 years of age. Also, avoid steam inhalation for children below 12 years of age. 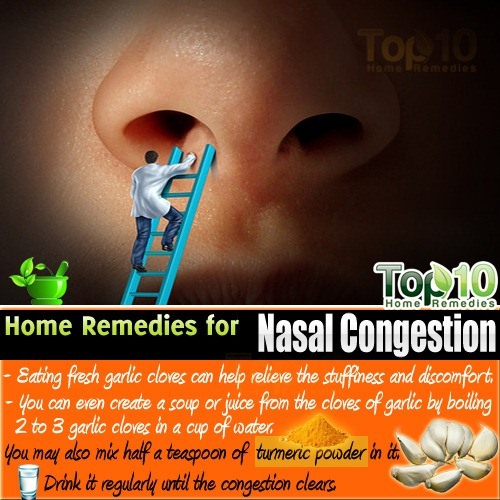 Garlic is one of the best home remedies for reducing nasal congestion. Its antiviral, antibacterial and antifungal properties help fight the respiratory infection causing congestion. It also helps control overproduction of mucus and prevents infection. It even promotes quick recovery, as garlic is a natural immune booster. Boil 2 to 3 garlic cloves in 1 cup of water. You may also mix in ½ teaspoon of turmeric powder. Drink it twice daily until the congestion clears. Eating fresh garlic cloves can also help relieve stuffiness and discomfort. Garlic supplements can also be taken on a regular basis to prevent or reduce the frequency of nasal congestion. Always consult your doctor before taking any kind of supplement. 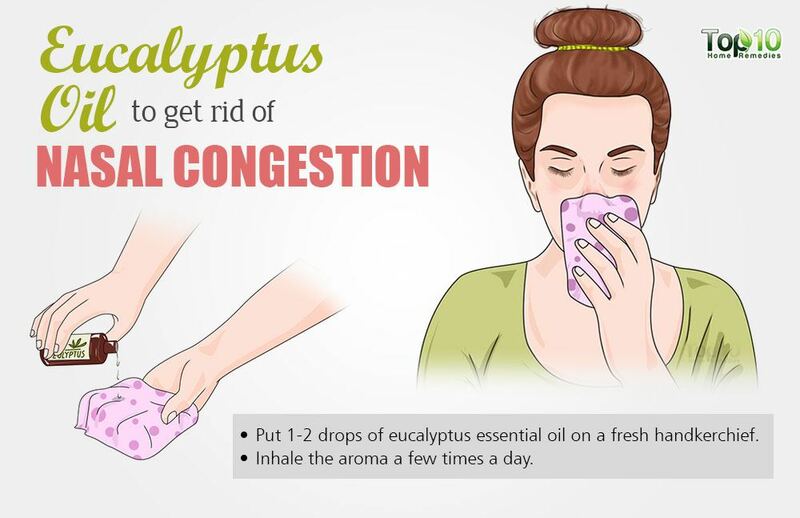 Eucalyptus oil is highly beneficial for those suffering from nasal congestion, thanks to its decongestant and anti-inflammatory properties. It helps clear airways of mucus and also works as a natural cough suppressant. Add 3 to 5 drops of eucalyptus oil to boiling water in a large pot. Use a towel to cover your head and slowly inhale the steam through your nose for no more than 2 minutes at a time. Keep your eyes closed. Do it twice daily. You can also simply put 1 or 2 drops of eucalyptus essential oil in a fresh handkerchief and inhale the aroma a few times a day. You can even put a few drops of eucalyptus essential oil on your pillow so you can inhale it even when you are in deep sleep. For an aromatherapy bath, add a few drops of eucalyptus essential oil to your bathwater and enjoy the bath for 15 minutes once daily. 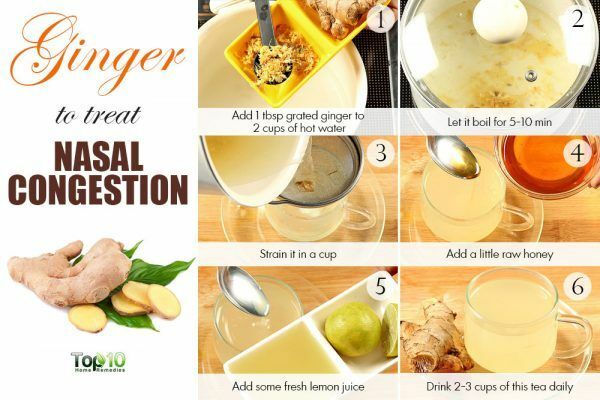 Ginger is another effective and easy remedy for a blocked nose. It has high antioxidant potential that helps inhibit the secretion of mucus. It also helps maintain normal nasal ciliary motility, an important element of sinus health. Drink 2 to 3 cups of warm ginger tea daily. To make the tea, boil 2 cups of water over low heat and add 1 tablespoon of fresh ginger slices in it. Let it simmer for 5 to 10 minutes. Strain, mix in some fresh lemon juice and raw honey, and drink it. Chewing small pieces of raw ginger sprinkled with salt several times a day can help treat a nasty cough and blocked nose. You can also take ginger in the form of lozenges, which are readily available in the market. 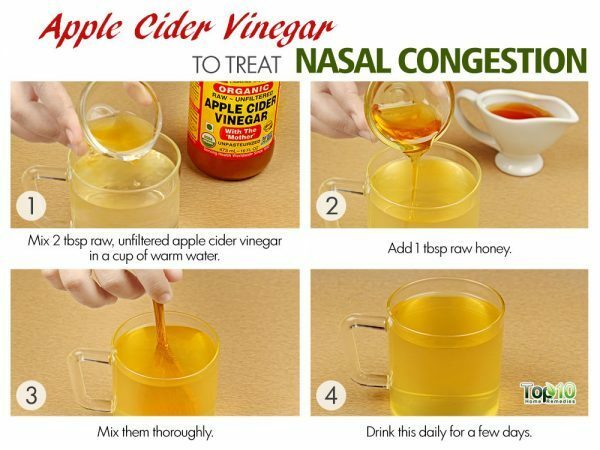 This is an excellent remedy for getting relief from nasal congestion, as it can help improve the flow of mucus through the nasal passages. As it contains healthy components such as tomato juice, garlic and lemon, spicy tomato tea is also good for giving a boost to your immunity. Boil 1 cup of tomato juice along with 2 garlic cloves (chopped), 2 to 3 teaspoons of freshly squeezed lemon juice, ½ teaspoon of hot sauce (if you do not have any hot sauce, use ¼ teaspoon of cayenne pepper) and a pinch of sea salt. Drink this tea slowly while it is hot, twice daily for a few days. Also, eat very spicy foods and include ginger, garlic, onion and red chili more often while preparing your food to make it spicier. You can also have chicken soup. 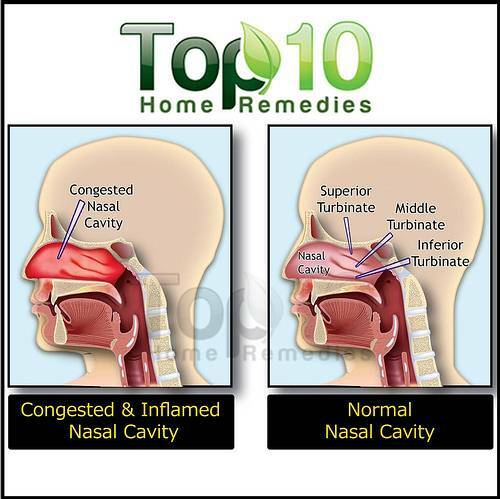 Turmeric works as a strong antioxidant, anti-inflammatory and antibacterial agent, thus making it another effective home remedy for nasal congestion. The curcumin in it helps reduce the swelling and inflammation in the nasal passages, thereby providing quick relief from the symptoms. It also gives your immune system a powerful and welcome boost. 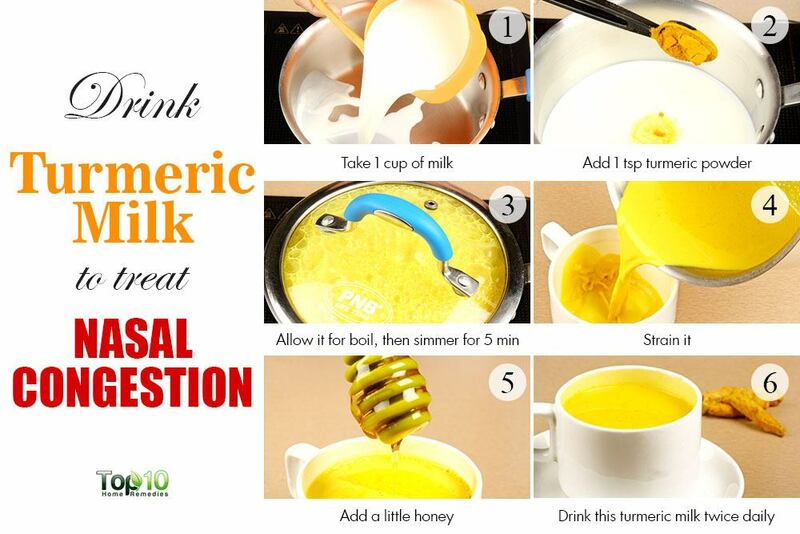 Heat 1 glass of milk, add 1 teaspoon of turmeric to it and let it boil and then simmer for 5 minutes. Pour it in a cup, add a little raw honey and drink this turmeric milk twice daily to speed up the healing process. Alternatively, mix together 2 tablespoons of turmeric juice, 1 tablespoon each of lemon juice and honey, and a pinch of cayenne pepper. Have this mixture 1 or 2 times daily. A warm compress applied on the nostrils can help unclog a stuffy nose by opening the nasal passages from the outside. thanks for the remedies. i’m going to try them and share if they helps. I been dealingwith sinusitis for about 3 months, i been to the doctor several times and nothing seems to work. any suggestions??? Use a Neti Pot. Its a simple pot with a spout like a tea pot. I couldn’t find it in India tough it is a Yoga concept. It is freely available in USA at any pharmacy or it can be purchased online. It is filled with luke warm water and a half teaspoon of table salt and quarter tea spoon of cooking soda. It is poured through one nostril and the water exits the other nostril Reverse the procedure till both nostrils are cleared. It irrigates the nasal cavities and desentisizes the nasal passage hence reducing allergic symptons. 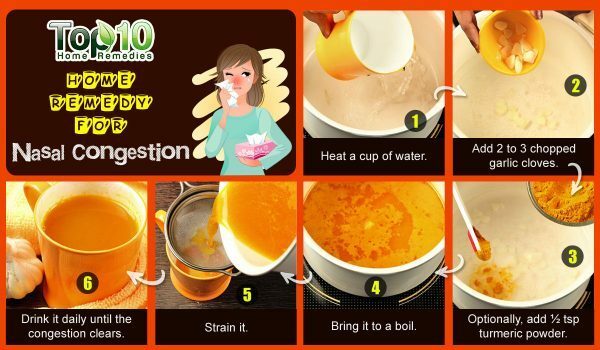 It also helps in clearing dry mucus and snot. Use it daily and you will notice remarkable improvement. Neti pot is dangerous i tried that already, so pls never ever suggest neti pot. It’s only dangerous if you’re using tap water. Distilled water or boiled non-iodized salt water is perfectly safe for internal use. They’re highly effective and safe if appropriate maintenance is performed to upkeep the neti pot. Kolonji oil, tea tree oil, and basil are all good to use in a neti pot (with distilled or boiled water and non-iodized salt). Incorporating turmeric, basil, ginger, and lemon into your diet will do wonders for your congestion and sinus infections. If none of these are working, you may want to seek out your family doctor or go to the free clinic. I have being using it successfully for 3yrs with amazing results, the secrets of using Neti pot is while using you must breath through your mouth while pouring into your nose & the best result is obtained by using slightly warm saline solution,I am so comfortable using Neti pot that I carry on conversation. I just did this and I feel better than I did. I will definitely use this step. 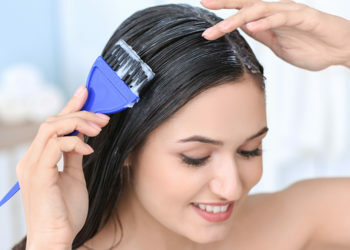 Boil water add tea tree oil then breath in for 10 minutes with a towel over your head. This should fix it do this 2x a day. The best thing I have found for sinus congestion is to use a netti pot at least 2 to 3 times a day; can be found in almost any drugstore…follow directions. friend please tell me netti pot this is tablet or spray. You do not inhale the water. You breathe through your mouth as you squeeze the solution through your nasal cavity until it come out the other side. No inhaling! How much lemon juice did you try? Can I add few drops of lemon or a full spoon of lemon. Also can we use the bottle lemon juice or shall I get lemon juice from real lemon. Please help as this is making me go nuts! I can recommend Nasal Spray with Turmeric (curcuma longa). I’ve bought a bottle (20ml) during my vocation in Vietnam. This product is manufactured by Thai Duong and also available in a couple of online stores. Thanks a lot i found it help full. Iam suffering from sinus for the last 3 years. Can you please give me a quick relief. Thanks for all the comments you all have posted I will try some. Thank you. Thanks for your enlightenment. I will try one of these. 4 drops thyme oil in a pan of boiled water now inhale through nose, one nostril at a time. Take steam for abt 2 minutes because it is very strong. Do this for a few days until nasal passages are clear. Not suitable for heart patients or high blood pressure. I am using nasal drops since last many years. If I don’t use nasal drops I can’t sleep. I want to leave this habit. What can be done. M gonna give the salt and water a try, should I drink it after boiling the water and?